To be honest, I’ve known very few Filipino vegetarians, though maybe it’s simply the company I keep. This does not mean that I’m a huge fan of roast suckling pig, or lechon, but I see its attraction. To appreciate the Filipino national dish, you have to be willing to see your animal go from farm to table right in front of you. (And for that, I must apologize for the featured Creative Commons photo by whologwhy.) 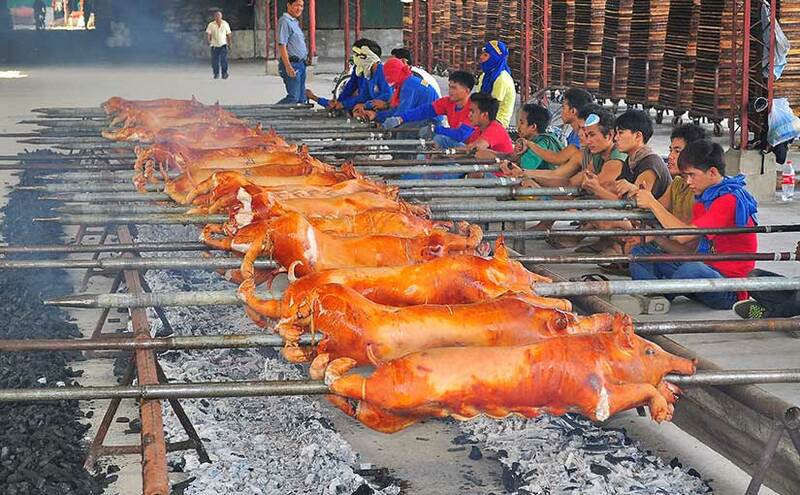 I’ve used a photo below of how the lechon would likely be served to you, cut right off the pig after being roasted on a spit for hours. Creative commons photo by Scott Mindeaux. Typically, the younger the piglet, the more fatty and therefore the more prized the lechon. Personally, I prefer more meaty lechon, which my barkada (my peeps) took as evidence of my poor taste. I let them have the lechon while I slyly ate all the kinilaw na tanigue (ceviche Spanish mackerel) or fresh lumpia (spring rolls), among other dishes.